Curated for New York's Anthology Film Archives by Astria Suparak, "Dirges and Sturgeons" premiered in October 2001. The program included work by Animal Charm, Lawrence Elbert, Bjorn Melhus, Pierre Yves Clouin, Jacqueline Goss, Miranda July, Seth Price, and others. Clouin's “The Little Big” ’(1999, photo), selected for Sundance 2001 was featured in the show.
" ... case in point: Pierre Yves Clouin's The Little Big, an up-close crevice of quievering flesh that maximizes its eroticism by keeping the viewer guessing about what body part is bing shown. That's what I like about experimental work --just having to work your brain a little harder instead of predicting the ending." 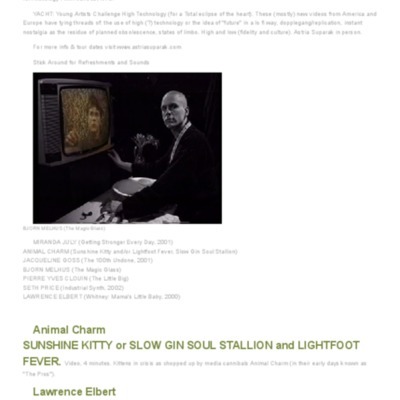 “"Dirges and Sturgeons" premiers Sometimes, danger and small warm things ,” Pierre Yves Clouin, accessed April 22, 2019, http://pierreyvesclouin.fr/items/show/186.